Mio MiVue 568 Touch digital video recorder (DVR) is the top of the range Mio MiVue model and features a 2.5-inch touchscreen display. In addition like many of the other MiVue models, the MiVue 568 features GPS tracking and speed camera warning. The Mio 568 records in 1080p High Definition (HD) quality not only when driving but also when parked using the parked mode. You can then set it up to detect motion and start recording any incidents that occur in front of your vehicle. It is designed with a 360 rotating design so that you can position the camera to record at any angle to capture incidents in front of your vehicle. The 568 also alerts you to speed cameras in the road ahead. Mio MiVue 568 Touch dash cam has been discontinued. Mio MiVue 568 is an in car cameras that has a 2.5-inch screen which is touchscreen and will record in 1080p full High Definition (HD). The video can then be used to record incidents and accidents in the road ahead. It records in a F1.8 aperture for low light conditions, has a 130 degree angle lens for recording the full view of the road ahead and has been built with a 360 degree rotating design that enables you to record any view of the road ahead you would like. There is a screen on the device so that you can playback the video anywhere at any time should you need or choose to. There is also an in-built microphone for recording sound inside your vehicle. This MiVue 568 also has GPS tracking capabilities so that you can track the position of your vehicle wherever you are. The GPS receiver is highly sensitive so you will always maintain a GPS fix. The GPS functionality also helps to provide information such as location, directions and speed. A unique feature of the Mio MiVue 568 is that it has a speed camera database which is for the lifetime of the product so you will always know where the fixed and mobile speed cameras are. These speed camera alerts are provided by RoadPilot. The screen displays your current speed, the speed limit and the distance to each camera. The Mio MiVue 568 model also has a parking and motion surveillance mode which detects motion in front of the camera and then starts recording for any incidents whilst your vehicle is parked. It also comes equipped with a 3-axis G-shock motion sensor so that you will know where impacts come from. Do you have a question about the MiVue 568 that's not been answered on this webpage? Please see our Dash Cam FAQ's for questions from other people. If the answer to your question isn't featured, use the online form to ask us for the answer. Alternatively please telephone 01733 777623 Monday to Friday (9:30am-5:00pm) to speak to one of our sales team. Because the Mio MiVue 568 has an internal rechargable battery you can choose to locate it cable-free behind the rear view mirror, which also helps to ensure the highest quality recordings and does not obstruct your view of the road ahead. Alternatively, you can use the included car charger to power the in car camera device. A windscreen mounting bracket is also provided. MiVue Manager is a tool for you to view the videos recorded on your MiVue 568 recorder. The Mio MiVue software can be downloaded from the Mio Service website. 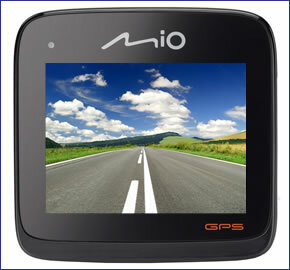 Looking for accessories and spares for the Mio MiVue 568 Touch? Accessories available to purchase from ActiveGPS include a replacement vehicle power cable, hardwire power cable and USB cable.